There is nothing more quintessentially Japanese than the idea of giant robots fighting giant monsters. Japanese producers have entertained audiences for five decades by pitting futuristic marvels of human ingenuity against lumbering, primeval and often mindless forces of nature. Perhaps that is what you get when you have a society that has embraced a kind of neon-soaked, "Blade Runner" aesthetic of the future yet, because of geography and geology, faces the ever-looming threat of primordial devastation from earthquakes and tsunamis. "Pacific Rim" director Guillermo del Toro ("Pan's Labyrinth") and screenwriter Travis Beacham ("Clash of the Titans") make no apologies for their love of Japanese cartoons (aka, anime) and monster movies. Peer into their film's DNA, and you'll find the genetic markers of everything from Gamera to Voltron. In the near future, humanity faces extinction when a dimensional rift opens deep beneath the Pacific Ocean, allowing creatures from another world to come through and flatten cities all across the Pacific Rim, from San Francisco to Sydney. To protect themselves from this seemingly endless parade of monsters, called kaiju, the nations of the Pacific Rim build giant robots, called jaegers, to fight them. Hey, it's exactly the strategy anyone who grew up on Japanese cartoons would adopt. The movie's characters are equally drawn from anime mainstays. 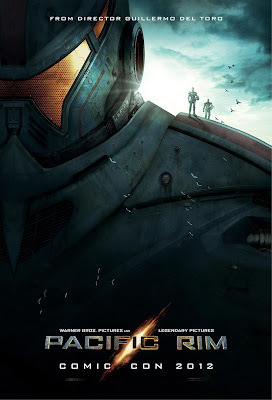 They include the heroic jaeger pilot (Charlie Hunnam), the hothead (Robert Kazinsky), the quiet but formidable female (Rinko Kikuchi), the gruff and stoic leader who is keeping a secret (Idris Elba) and not one but two mad scientists who double as comic relief (Charlie Day and Burn Gorman). "Pacific Rim" is a direct descendent of "Neon Genesis Evangelion," the influential 1990s anime series that took all of the "giant robot" cliches and mixed them with a heady dose of Carl Jung and Sigmund Freud. Del Toro and Beacham dial down the Freud. 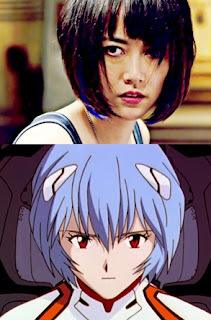 But just about every character still has daddy issues, especially Kikuchi's Mako Mori, who, with her purple-streaked hair and quiet demeanor, is the flesh-and-blood embodiment of "Evangelion" dream girl Rei Ayanami. Basically "Pacific Rim" is from the template Japanese animators have used for decades, only now translated, by a Mexican director and an American screenwriter, into a colorful, action-packed, live-action thrill ride that's stripped down to the Platonic ideal of the robot vs. monster genre. While the American-produced "Godzilla" of 1998 hid its monster, the kaiju of "Pacific Rim" are impossible to miss. While Michael Bay's "Transformers" films are an incoherent blur of CGI, the fights of "Pacific Rim" form a brilliantly choreographed ballet of destruction. In "Pacific Rim," the power of nature is everywhere. Even when kaiju aren't attacking, our heroes' last-stand sanctuary in Hong Kong is besieged by monsoon conditions. But if nature is a constant threat, humanity's official institutions are a constant failure. Shades of Hurricane Katrina. The world's governments abandon the jaeger program in favor of building a giant wall, which, unsurprisingly, fails to keep out the kaiju. Elba's Stacker Pentecost, however, opts for a more comprehensive solution to the "alien" problem. He turns to underground figures like Hong Kong crime lord Hannibal Chau (Ron Perlman), who can get him anything he needs, for a price. Unlike other post-9/11 disaster movies that dwell on the visuals of falling buildings and ruined cities, "Pacific Rim," when not caught up in its spectacular metal-on-monster mayhem, focuses on how the human spirit overcomes a crisis, even in the face of that most intractable of monsters — the foolish politician.